"There is no discord over seat-sharing in the NDA in the 2019 Lok Sabha polls. 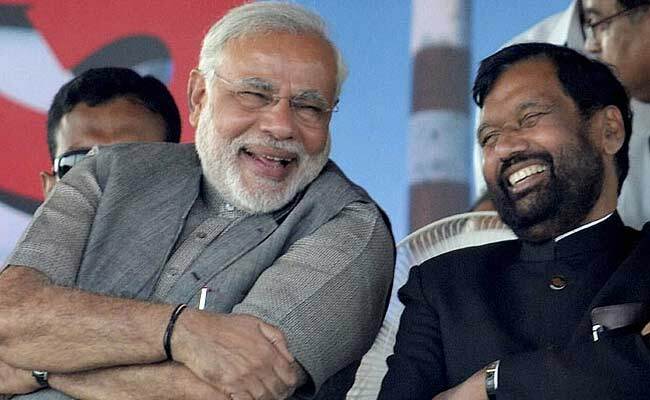 All coalition partners in Bihar are working together so that the NDA is able to bag all the 40 seats falling in the state," Mr Paswan told PTI. Patna/Rajgir: Union Minister and Lok Janshakti Party (LJP) chief Ram Vilas Paswan today said there was no tussle within the NDA over seat sharing for the next general election in Bihar after JD(U) joined the coalition recently. Mr Paswan was responding to speculations that the entry of JD(U) has led to consternation among older BJP allies in Bihar like the LJP, which had put up an impressive performance in the 2014 Lok Sabha elections, winning six out of seven seats it had contested. The Union Minister for Consumer Affairs, Food and Public Distribution who is at Rajgir in Nalanda district to attend LJP's two-day national convention, however, sought to dismiss such misgivings. "We had done spectacularly well in 2014 when Nitish Kumar was not with us. In the Bihar Assembly polls, the following year we had no problems whatsoever with regard to seat sharing. With Nitish in our camp, we are looking forward to doing it only better," Mr Paswan said. Mr Nitish Kumar is the JD(U) president and chief minister of Bihar. On the talks of holding Lok Sabha and Assembly polls simultaneously, Mr Paswan said "In principle, I am in favour of such an arrangement". To a query on RJD chief Lalu Prasad who was questioned by the CBI in connection with the hotels-for-land scam in New Delhi during the day, Mr Paswan said, "Law is taking its own course". "One cannot understand their allegation that they are being harassed by the Centre. It should be remembered that the fodder scam had come to light when there was no NDA government and the then Prime Minister IK Gujral happened to be one who was made a Rajya Sabha member from Bihar with Lalu's help", Mr Paswan added. LJP parliamentary board president Chirag Paswan said, "Our workers from across the country have gathered at the venue and we are telling them to work in accordance with the ideology of BR Ambedkar whom we follow". "We are also laying stress on apprising the common people of the initiatives taken by the Narendra Modi government at the Centre," he added.